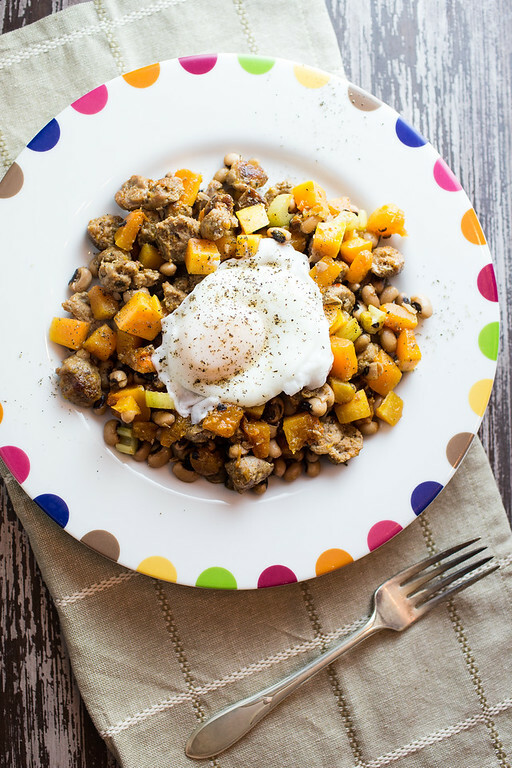 Spicy sausage, sweet butternut squash and earthy black-eyed peas topped with a perfectly cooked poached egg. You’ll want it for breakfast, lunch and dinner! 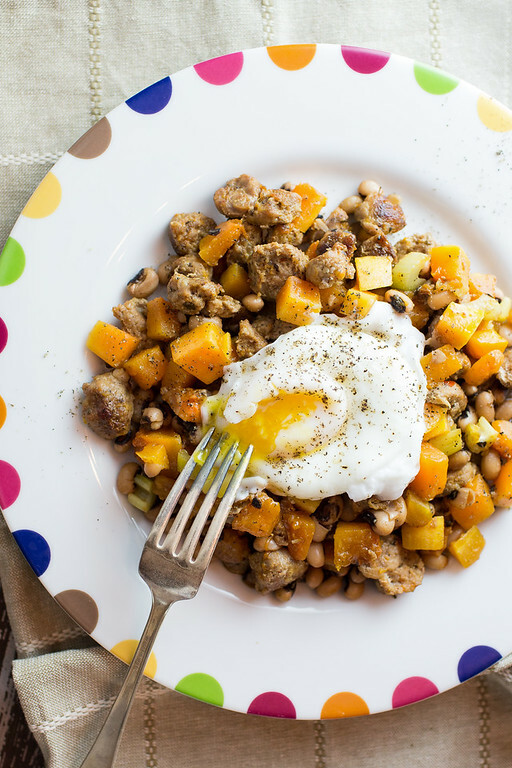 Andouille sausage, celery, butternut squash, thyme, vinegar, Worcestershire sauce, Dijon mustard, black-eyed peas, and eggs. Pure comfort food! The beauty of a hash, besides how delicious they are is that they can be served for breakfast, lunch or dinner! A hash can be made from scratch or it’s a great way to use up leftover cooked meat and vegetables from a previous nights dinner. You chop everything up into small bite size pieces, add your favorite spices, saute until nice and browned and top with a fried or poached egg. Once you make hash a few times, you’ll get a feel for what works and what might not work. I found this recipe on Cooking Light and it had more of a summer feel, with tomatoes, red bell pepper and yellow squash. To turn it into a more wintery feel, I used butternut squash and celery and instead of turkey sausage used andouille sausage. Depending on your meat and vegetables, the steps for your hash might be a bit different. Choose your meat and vegetables and cut them into bite sized pieces. Brown the meat and add your vegetables, sauté until tender, adding a little broth or liquid if you’d like. Fry or poach and egg. Serve hash with egg on top. Andouille Sausage – can use mild pork or turkey sausage or cooked leftover meat. Celery – can also include onion, leeks, green bell peppers. Butternut squash – sweet potatoes or other winter squash will also work. For a summery version use zucchini. Fresh thyme – can use dried. Dijon Mustard – or a good grainy mustard. 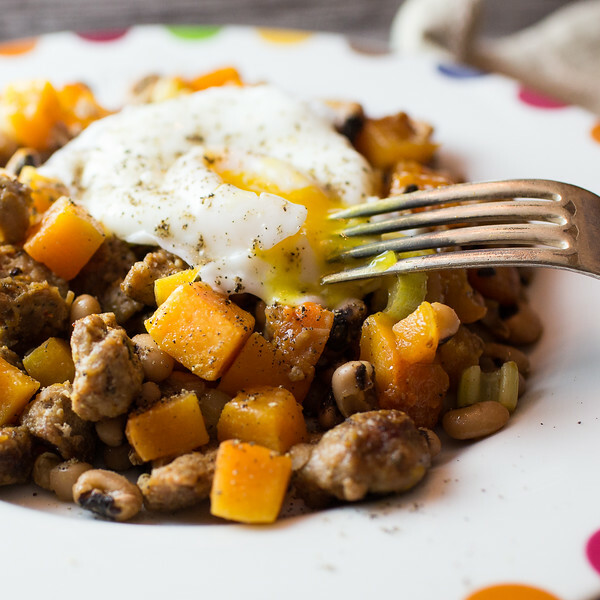 If you’re looking for another recipe that combines black-eyed peas and butternut squash – this Black-Eyed Peas Salad is a favorite! Heat a large skillet over medium heat with a drizzle of olive oil. Add sausage and brown, crumbling it with a wooden spoon. Add celery and butternut squash. Stirring occasionally, cook until butternut squash is golden and tender, about 10 - 15 minutes. Add the water, thyme, vinegar, Worcestershire sauce, mustard and black-eyed peas. Let simmer for about 2 minutes and then reduce heat to low. Heat a small skillet with several inches of water in it, until it is just barely boiling. Add a teaspoon of vinegar. Crack the eggs in into a small bowl and gently pour them into the water. Cook for about 2 minutes to keep a nice yolk. Scoop eggs out with a slotted spoon. Divide hash between four plates and top with an egg and a generous grinding of fresh black pepper. Andouille Sausage - can use mild pork or turkey sausage or cooked leftover meat. Celery - can also include onion, leeks, green bell peppers. Butternut squash - sweet potatoes or other winter squash will also work. For a summery version use zucchini. Fresh thyme - can use dried - use 1/2 teaspoon dried. Dijon Mustard - or a good grainy mustard. What a great low carb breakfast idea!!! Hubby often does a low carb diet, usually after a big holiday or event where he has eaten or drunk more than he would like. I struggle so much with low carb ideas for breakfast. He get tired of omelettes very quickly. Pinning this as it is perfect for him! THANK YOU !!!! I just bought black eye peas and wasn’t sure what to make them . Looks like I have a new recipe to try now! This is the kind of dinner I love to make myself after a long day, it looks amazing! This looks delicious and I need to make this recipe soon! Thanks for sharing! Spicy and sweet – oh my! That dish looks incredible and I think I would gobble it all down in no time. Love the addition of the andouille. That makes this dish!